Durable Material -- 5 mm thick premium quality acrylic guarantee the most sturdy solid bathroom shelf for a liftime. Floating Display -- Invisible design save your bathroom space and easy access to bathe goods. Space saver -- Minimal look with maximum space for books and other accounterment,a must-have for small spaces. Safe round edge -- Hand-polished round edge keeps toddlers away from exposing a razor sharp edge for safety. Elegant showcase-- Steamlined storage rack perfect for showing frames,collections,CDs,bottles on an awesome way. 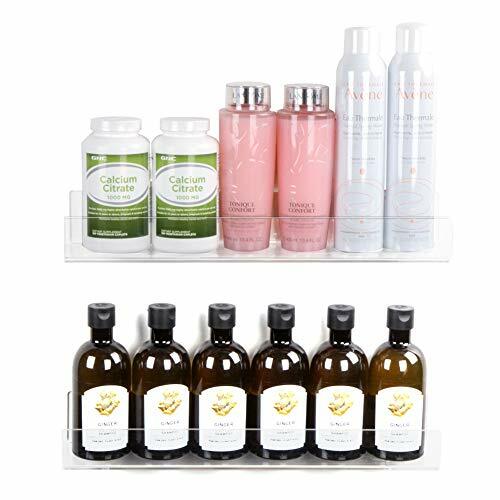 [DURABLE & UNBREAKABLE] Niubee Acrylic Bathroom Shelf is made of 5mm twice thicker premium quality acrylic with lifetime guarantee.Acrylic is the ideal choice for damp or steamy areas as it never rusts, peels or tarnishes. [SPACE SAVER] The generous 3 inch ledge fits all your cosmetics, perfume, shampoo & accessories, and is perfect for shaving tools. Versatile storage shelving and the small, neat size fits plenty of bottles and jars, giving you back tons of room on your work space, cupboards, countertop and in your drawers. [USE ANYWHERE IN YOUR HOSUE] This clear wall shelf is perfect for displaying your books, spices, pictures, memorabilia and collections.The invisible design matches every Décor in your kitchen, bedroom, pantry, which is the #1 choice as a gift. [EASY INSTALLATION] It comes with all needed accessories and an instruction,even a screwdriver is included. We are committed to providing the most intimate goods and services,so there is no need for you to buy any other inatallation hardwares. [100% GUARANTEE] Niubee guarantee 30 days money back and 1 year quality warranty, get our service support for any unhappy shopping experience. If you have any questions about this product by NIUBEE, contact us by completing and submitting the form below. If you are looking for a specif part number, please include it with your message.